Hopeful Despair was purchased June 30th, 2009 and is being hosted on Dreamhost. It was a name that I coined up in a sort of tribute to two of my favorite characters/one of my favorite couples: Nozomu Itoshiki and Kafuka Fuura from Sayonara Zetsubou Sensei. 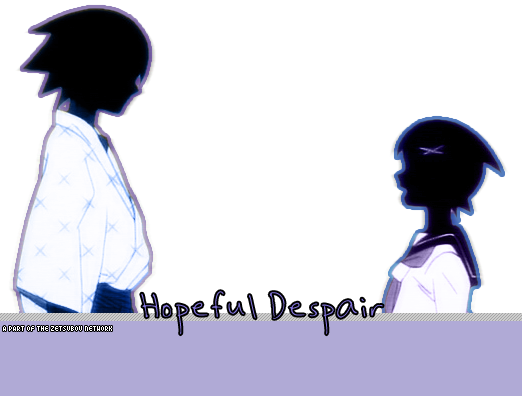 Nozomu is the despairing Zetsubou-sensei, and Kafuka is one of his students, who is hopeful and optimistic. You put them together and they're hopeful despair! The layout features, of course, Sensei and Kafuka :3 It uses two of my favorite colors, blue and purple. Made in Adobe Photoshop CS2, and coded in Notepad. Background texture from Squidfingers.